Supporting primary education is a critical part of the Waterworks Museum mission and the Trustees are very proud of the education service the Museum provides. A stimulating learning environment - in our Education Centre and in the grounds. A broad curriculum led service, delivered by a qualified teacher and free to use. Whether visiting on your own, with family and friends or as part of an organised visit, our aim is that every time someone comes to the Waterworks Museum they will leave having learned something new. Take a look at what we can offer. 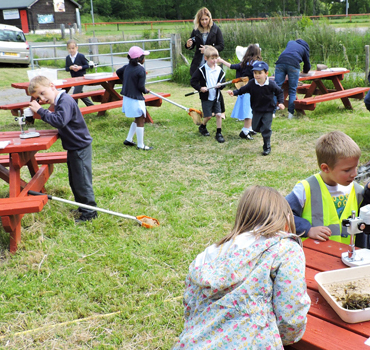 Primary school activities (Key Stages 1 and 2) are organised in co-operation with Dŵr Cymru Welsh Water with all sessions taught by a qualified primary science teacher. The education programme is aimed at pupils from 7-11 years old and covers many aspects of Science, Geography, History and Education for Sustainable Development. 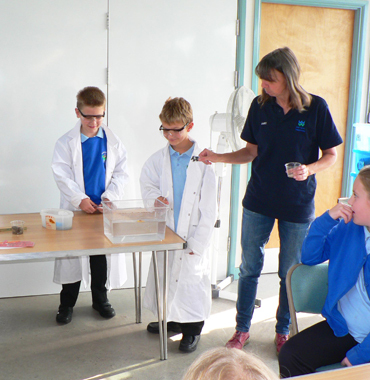 Pupils spend a full day at the Museum and learn about water and the vital role it plays in our lives. There is plenty of hands-on work including simple water-filtering experiments and pond-dipping. By prior discussion, sessions suitable for Key Stage 1 can also be provided. For information contact: education@dwrcymru.com. Schools and centres catering for children and young adults with additional learning needs are warmly welcomed. Sessions can be arranged by prior discussion and tailored to suit the needs of the group. The whole Museum is accessible for wheelchair users either directly or by closed-circuit television. Our Volunteers will gladly give occasional talks in schools or to adult groups, clubs and societies in the wider community. Full audio-visual support is available. A range of materials from quiz and colouring cards to simplified guidebooks for younger visitors from pre-school to early teens. The smallest ones can follow the trail of Freddy the naughty frog whilst older children can complete the time-line of famous engineers.